While the Germans are building robot monkeys, the Brits are building pee-drinking robots. Scientists in Bristol are developing robots that run on urine. They've built a pee-pump that will, um, pump pee, or something. Apparently, regular pumps won't get near pee. Although I can think of many waste treatment facilities that don't know that yet. Anyway, these British scientists have developed a pump for pumping urine that will be used to power EcoBots. And, it seems, EcoBots are robots that run on waste. Like pee. These are the same people that developed a cell phone that runs on pee. I'm seeing a pattern here. Somebody there has a urine fetish. And, they're trying to monetize it. Golden showers of money, so to speak. What I'm seeing is trouble. 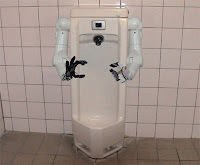 There are going to be robots that don't just run on, but crave, human urine. And, they'll have cell phones, so they can call up their robot friends and surround some poor slob and steal his pee. You're thinking, "Hey, it's in the U.K. That don't impact me one bit." But, with a cell phone, a robot can order a plane ticket and fly to the U.S. and hunt you down. They'll no trouble getting past security, because those jackasses are too busy patting down 90-year-old grandmas and putting two-year-olds on no-fly lists to worry about a pee-drinking robot wandering on to a plane. So, be ever vigilant and watch out for the pee-craving robots. Else, urine for a rough time. Should we be concerned about a World wide shortage? Are there any estimates of when we will reach peak pee? So... Bear Grylls is a cyborg? After that line, you're lucky it's not possible to slap people through the internet. "Else, urine for a rough time." If we get pissed about this the robots win. P*ss on you , I'm workin' for Mel Brooks! we haven't reached peak pee as long as there is beer left in the world. Are they behind the Dell Latitude E6430u as well? That computer is a belated Breaking Bad tie-in.